This was a Cyanotype Drop-in Session I ran at Cardiff Print Workshop. After my short introduction about the history and process of cyanotype printmaking, participants experimented with a variety of objects and techniques to produce interesting, abstract photograms. Derek’s space-inspired piece using glass beads, agate, seeds and water. Prints developing in the bus stop: Charlotte Biszewski‘s cyanotype session at Spike Island in Bristol. One giant banner of tracing paper transferred onto the prepared paper for exposure by the sun (which happily obliged, despite rain forecast). Automatic drawing or painting can be described as “expressing the subconscious” using any technique that eliminates conscious control and replaces it with chance. The basic techniques originate from spiritualism, practiced by artists such as Georgiana Houghton and Hilma Af Klint, both of whom have recently had their work exhibited in a revival of interest and appreciation of automatism and early abstraction. 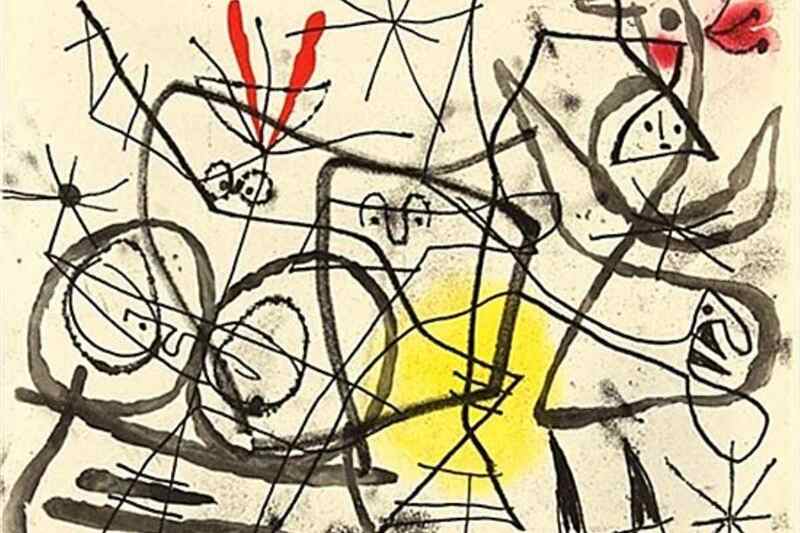 Surrealists such as Andre Breton and Andre Masson, were keen to experiment with automatic drawing and promoted it as an art movement. By this time, of course, psychologists of the unconscious had dismissed the idea of spirits speaking through the artist: it was the subliminal self that could express itself in ways that could lead to the development of real artistic genius. The new interpretive framework was now wholly secular and based on the insights of psychoanalysis, but the basic techniques were adopted from spiritualism. Whichever way you wish to interpret it, drawing randomly without rational control is a good way to avoid inihibitions that freeze the flow of creativity. It is a way to bypass the ‘I can’t draw’ mentality a lot of people develop when the natural artistic confidence of childhood is abandoned. Making simple marks and considering the relationships between them bypasses jugement by the logical brain about what is “good” or “accurate.” It opens the doorway to the intuition, allows the emotions to be engaged, and allows enjoyment of the pure physical experience of artmaking. One of Georgiana Houghton’s spirit drawings – The Eye of the Lord (1 Sept 1870), and Joan Miro – Preparations for Birds, detail, 1963.